Here are some templates to make the popular pocket invitations that you may have seen here on make-your-own-invitations.com. We will be adding more templates in the near future so check back regularly. If you have a suggestion for an invitation template then please be sure to let us know. Click on the invitation to see more details. This invitation template is in a PDF file format and can be printed on to 11" x 8½" paper. You will need to have Adobe acrobat reader installed on you computer to be able to open the file. There are instructions for use included but you basically need to print out the template then cut it out. Measurements: Final assembled pocket measures 4¼" x 5½"
Invitation Inserts: The inserts should be no larger than 4" x 5¼" in size. 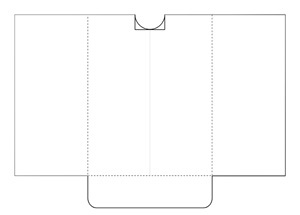 The pocket can hold 2 - 4 inserts depending on thickness of the inserts used. 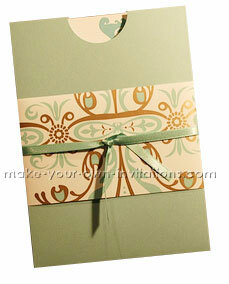 Example of assembled pocket with a cardstock insert.